Hi everyone! We’ve been a bit quiet lately since we’ve been busy updating all of our plugins to be compatible with WooCommerce 2.1. However, we wanted to share some of the big changes we’ve made with you to some of the WooCommerce extensions we offer, so we’ll take a look at the WooCommerce Customer / Order CSV Export Suite first. This tool was available previously, but was a bit difficult to use. We’ve simplified the tool by requiring a CSV format to be selected under “Settings”, then you simply select the order statuses you wish to export, and the date range for customer or order exports, and that’s it. We’re really excited to share the new features we’ve added to the export settings, and think you’ll love them. We’ve added the ability to monitor exports from the “Orders” page to quickly view which orders have already been exported and which are still waiting for export. We’ve also added automatic exports to the plugin so that you don’t have to manually export orders each day (or multiple times a day!). You can automatically export orders via FTP or HTTP POST in a custom interval (default is 30 minutes) so that you no longer have to manually export orders. You can also automatically upload orders to a remove server via FTP to streamline data transfer between your WooCommerce store and external services, saving time every single day. Basically, we’ve tried to take a plugin that was previously a machete and turn it into an export Swiss Army Knife. That can even cut stuff for you automatically. We’ve added a new default export format to the plugin that includes more fields, and simplifies some of the export output. However, we’ve also kept the previous export formats in the plugin (labeled as Legacy formats). You can check out some sample export files if you want to see the changes we’ve made. You can view more information from the WooCommerce Customer / Order CSV Export Suite sales page at WooCommerce, or the full plugin documentation. Go forth and automatically export! Ask SkyVerge: How Do I Sort WooCommerce Order Items Alphabetically? How about product custom fields? Can those be exported too? Hi Stephen, please fill out a contact request to get in touch and we’ll be happy to help out. What a great update! I really love the streamlining and the automatic exports. I’m also glad you kept the old one row per item format around since that’s the easiest way to get per-product data into a spreadsheet for analysis. I was about to ask for the addition of fields for the payment type and payment confirmation but I’ll have a look at that export filter example you linked to and see if I can build a solution from that. I do have one small complaint, though, and that’s the export status column added to the orders screen. It takes up a lot of width and the bright color screams “I’m the most important thing on the entire page!” 😉 It’s a lot of visual weight considering the WooCommerce status became smaller and more subtle on the previous release. It would be nice to be able to just turn it off most of the time. Hey Doug, thanks for your thoughts! You can turn the export status off by going to “Screen Options” at the top of the page and disabling it if you prefer. As for the icon, we wanted to keep the same color as the WooCommerce order status icon, but ensure that they were different for quick visual check. See your point about the weight of the checkmark though – will look into it. When I read your reply I realized we must be seeing two different things. I did some digging and found that I had a security measures on my server that were stopping the plugin’s css and js from loading. What I was seeing was the words “Not Exported” wrapped in an HTML mark tag. Since the css wasn’t applying it took on the default bright yellow highlighter look. Now that I’ve corrected that problem I see that the plugin overrides that tag with much more subtle icons. I apologize for the false alarm and any confusion. You must have been scratching your head trying to figure out what I was reacting so strongly to. 🙂 Thank you for such a kind response in light of that. Well done! The normal quality of your plugins is so high that I should have suspected something else was amiss. Thanks also for the helpful tip about the screen options and the developer docs. Those are very useful. I’m trying to add a custom field from the Order — previously the code you supplied to add custom fields worked but this new release seems to have broken that code and the custom field no longer shows up. I’ve tried the new custom field code from the developer documentation and it breaks the .csv I end up with an additional row with just the first letter of the custom field repeated in every column. I’ve triple checked my code and checked my old backed up install and I am finding this incredibly frustrating. How do we put custom fields into the CSV while using Legacy One Item Per Row and the Legacy export format? Hi there, this sounds like something that we’d have to take a closer look at – could you fill out a contact request and include a WooCommerce support ticket number for the CSV Export so we can pull up the ticket to help out? I wish to purchase this plugin. However, I am not 100% familiar with the options for export. Etc! Is this possible? Or know of a plugin that may do this? THANK YOU! Hi there, you could probably do this a couple of ways. First, if you have the hardcover/softcover as variations of the product, you could view these sales within the built-in WooCommerce reporting, then export these reports to CSV. You can also use our plugin to do this with the default export format, which includes product variations in the CSV file. If you only need to view the sales of each type/variation, then using the default reporting is probably your best bet as the exporter is more for individual orders than products. Can I export to two different logistic centers/ftp accounts. Example: Private orders to one ftp and the Business orders to another ftp? I’m attempting to automatically export via FTP but I keep getting : Test failed: FTP Server is blank. I’ve triple checked my credentials and all seems well with the FTP set up. Hey, have you tried saving settings first before clicking the test button? We also have a fix coming out for this soon that won’t require saving. Can I export orders based on categories? Can each row contains products sold in that order? I wanna go to export all products automatically, is this plugin capable for that ? Hi there, this plugin only exports orders and customers (order can be exported automatically). You’d need the WooCommerce Product CSV Import / Export (http://www.woocommerce.com/products/product-csv-import-suite/) to manage products. What does this mean and how does it work? We just want to send orders out at the same time every day, once per day. How do we do that? Hey Brandon, if you want to export orders once each day, an interval of 1440 minutes should do the trick. Keep an eye out for the update that’s being pushed out today or tomorrow, as you can also set a custom starting time now with this extension. FYI for anyone else: this update also will let you export via email if you’d prefer to get your CSV that way. I purchased your plugin and am also having some trouble with the automatic FTP feature. Testing works. The test.csv file is uploaded. There are no errors in the log file. But no new orders are exported and uploaded. I’ve tried setting the start time say to 1pm. With 5 minute intervals. I’ve placed orders waited and nothing is uploaded. I installed Core Control which allows me to view all Cron jobs in WordPress. I see the 5 minute interval job and when I manually launch it, the export works correctly. It’s installed on a VPS, crond is working, wp-cron is not disabled. Hi Peter, have you filled out a support ticket with WooCommerce for this? It sounds like something we’d have to dig into further. If you paste your WooCommerce ticket number here or enter it in this form we can get our development team to start troubleshooting immediately. One option on this page is to filter by ‘Order Statuses’ and I would like to extend this to be able to filter the search by an additional field. I didn’t see any obvious hooks to bind in to before these filter fields are displayed. Hey Client, look in the plugin code for the wc_customer_order_csv_export_settings filter — you can use that to add additional options and then use the query args filter you mentioned to check that custom option and add it into the WP_Query that’s used to find the orders to export. Hi, we are having the same issue as Peter. Has this issue been addressed? If so, please let us know how to fix it. Hi Alex, this is something we’re not able to replicate locally, so we’d need to dig into the issue in your environment. Can you please submit a ticket at WooCommerce and paste your ticket number here or enter it in this form? This allows us to get our development team to start troubleshooting immediately. Thank you for the response. I submitted the form with my WooCommerce ticket number for this issue. Thanks! I’ve pulled this up and forwarded it to our dev team to look into it. I really need to be able to include the main product image with the orders. I have been searching for a simple and solid orders export plugin to seamlessly send my orders to my supplier,, but they always need to verify the product by image… Any suggestions? Sure, you could certainly add a link back to the product image by using the filters in the plugin to customize the output format. 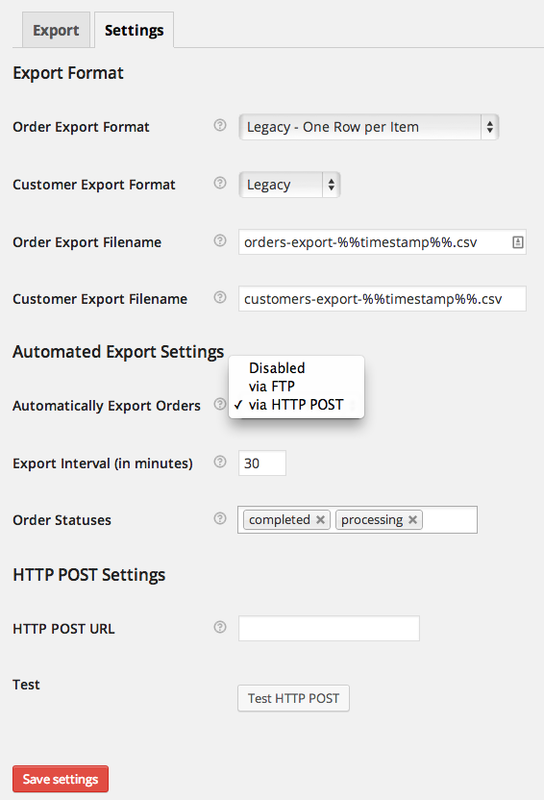 I tried to add an additional form field to the export page by using wc_customer_order_csv_export_settings filter from the present theme functions.php. But nothing is working. Can you please help me how to do this from theme functions.php? Thank you. I would also like to know if it is possible to show the tax % per row? I’ve installed the plugin and everything exports out well, except the weight of each product. How can I add the weight to the export? Thanks! If you point me to the docs, can you tell me which section in the docs to look? I agree, this would be a nice thing to have in the docs 🙂 I’ve added an issue to our internal tracker to get it added at some point. Currently we have export by Customer and by Order. I added some meta field and want to export by these meta field. Is this possible without breaking future update ? Yep, you’ll want to look under “Admin Fields” and “Exporting…” in the developer docs to get an idea on how this is done. this filter is not in my plugin. Am I missing something ? Is it possible to export total cart weight with thus plugin? Is it possible to put total order weight into the plugin output? The automated FTP does not seem to be working for me. The “Test FTP” works fine (I see the test.csv in the ftp directory), and manual export works fine. Nothing has been exported for about a week (since 7 July). I installed Crontrol, and I can see the wp-cron job scheduled, but when I click “run now” nothing happens (that is to say that nothing shows up on the ftp directory). Some of the online docs indicate a debug mode, but I don’t see it on the settings tab. Hey Mark, can you please submit a ticket at WooCommerce and enter the ticket number in this form? This sounds like something we’ll have to troubleshoot further. Thanks! I created a support-tickert on WooCommerce, but maybe here is the better place to find an answer. Hey there, I’ve forwarded your ticket to our dev team, but as an FYI the Legacy – one per row format will put every item in a new row, so this is where you’d want to start (under CSV Export > Settings). You should see a response from them soon! Damn, so easy! I didn’t think about that option. But I have another question: Using Legacy – One Row per Item format I get all line items in extra rows, which is great. But I can’t find the tax rate in the $order_data, and I need it to be exported as well. Do you have an idea, how I get line items tax rate in the function wc_csv_export_modify_row_data? Hi Beka, forget my last reply, I found a solution for all of that. Hey Krabbe, glad to hear it and thanks for the kind words! Of course I could change the extension manually to only .csv, but it would be nice to have it done programatically. It should be possible I guess. Hey Krabbe, is this by chance opened on the Mac before being imported on a Windows system? It’s UTF-8 encoded and this shouldn’t be an issue, but if it’s opened on a Mac, it will be saved in that format and could potentially cause this error. If that’s not the case, you could open a ticket at WooCommerce for us? I’m not able to replicate this, so it’s probably something that we’d have to dig into further. Thanks! Thanks for your quick reply. Yes it’s opened on a Mac, but not saved again, so there couldn’t be done modifications to the characters there. I will switch over to woothemes to open a ticket for that. Now all special characters are imported the right way. Previously I have used a plugin from Visser Labs – the paid version – for expording orders to excel, but the plugin makes the website so slow, that it is almost un-usable. Now I have read much of your plugin, but I want to be sure, that the plugin can handle the export needed, before I recommend buying the plugin to the owner of the website. Can this plugin handle the request from the owner – without modifications ? 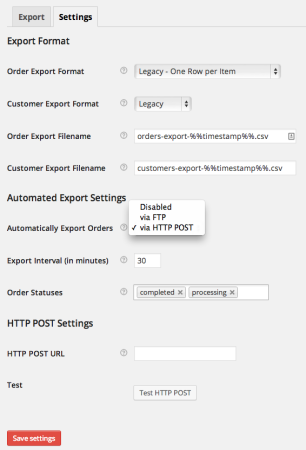 Hey Jesper, you can do manual exports or automatic daily exports with our plugin. It will include columns for each of your required items – I think the default format would probably work best for you. If you’d like to see some sample exports for each format, we have some sample CSVs in the documenation, which may help to confirm before purchasing. Thanks! Hi there, I’m really hoping you can help me out, I’ve looked everywhere but not been able to find an answer to (quite probably) a simple problem. I am writing an additional plugin to change the output of the original CSV. Most of these new columns use product custom fields which I have been able to add with no problem but for a couple I need to get the data which is outputted by default and then do a calculation with that data. What I also need to get is the SKU for each order and assign it to a variable but no matter what I try the answer eludes me! Is there a way of getting the SKU and assigning it to a variable before outputting it to a new column? Hey there, we can take a look at what you’ve written up so far and make suggestions if you submit a support ticket number here. I’m afraid it’s a bit difficult to explain via comment 🙂 . We have been using the plugin for about a week now for nightly emailed .csv’s, but we’ve noticed that we are seeing some of the orders are being sent two nights in a row. 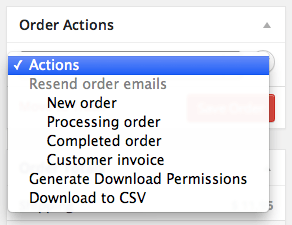 Shouldn’t the csv plugin set the exported flag on an order, and then not include that order the next night? This is a problem for our distributor, not major, but still a problem. Hey Rex, this is sounds a bit strange – we’d be happy to take a look at this for you. Could you please submit a support ticket here so we can get the needed info, and then reply back with the 6-digit ticket number? That way I can pull the ticket and make sure it’s assigned. Thanks! How do I export only a specific product and not all. I would like to be able to export orders and customers in sync with bookings in a more eficient way for the moment Im using CSV export. When I import the customers with the CSV import suite (skyverge) is fast an automatic, but when I import the orders I am able to do so, but then, I have to go one by one to create a new booking for each order, so I can see the booking (reservations) in the calendar . Is there a way to import the orders in sync with the bookings so the calendar is also populated?. I’m not sure if Bookings has a CSV import feature yet, but when they do you could use that to import both at the same time. Otherwise I think you’d need some custom code to create the bookings based on the new orders that are imported. hope this helps! Please let us know whether you have a utility to import products in woocommerce in an automated way in time intervals. I enter a large number of customer orders manually in the woocommerce backend so my customer database wothin woo commerce is a split of 80% through my website and 20% through the add order backend. My question is will the customer export function correctly export all the customers that have orders associated with them or just the ones who have gone through the checkout process and leave the 20% of manually entered orders behind. Manually added customers will be included, as the customer export will include any customer that has an order placed with their account. If you manually add a customer and have assigned at least one order to him or her, the customer will be included in the export. Any suggestions on how you can export email addresses based on a specific product? So I could email people who bought that product? 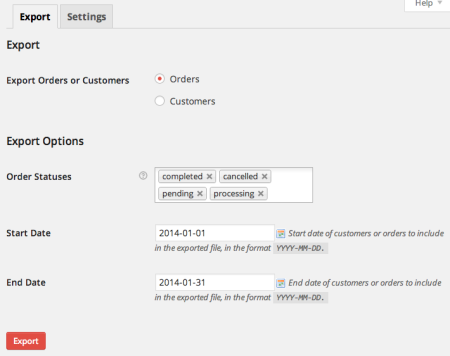 I have a customer who is using Admin Custom Fields for the orders to track sales by sales representative. We are wondering if this plugin would allow us to create a custom export which displayed this field and the general sales information for a given month? any way to add a gross sales column? Hey mike, not sure what you’re asking — could you clarify? This plugin will export a CSV of each order placed in the shop (based on a date range, order status, etc), rather than the total sales data, so not sure what you’d be expecting with a gross sales column. Would love to provide a better answer with more info :). Hi – I have been searching for a plugin like this for WEEKS! SO HAPPY I found this! Your product takes care of 98% of what I need! One last desire…is this possible? I LOVE how it explains which coupon they used, but it still lists the order as the total cost of the product. It doesn’t actually deduct the coupon. Is there a report you can create that DOES show what the customer actually paid, instead of what they “would have paid” prior to the coupon? Thanks so much!! LOVE this! Hi Sarah, the order total and item totals show the discounted price, not the regular price, for all items in the order (just as the WooCommerce order itself shows this). This holds true for each export format, so if you’re seeing the original price instead, please definitely open a support ticket so we can look into this! I have a client (online food) who wants to use WooCommerce to take orders and then just print off a summary of orders for the kitchen (as well as a shipping list for which I have fond another plugin. And put it on the wall in her kitchen – sort of ap ick list but simpler. Does the plugin do this perhaps? Hey Darren, our developer documentation should point you in the right direction. Hey Bertrand, our developer docs should help point you in the right direction, or we typically recommend Codeable for these sorts of small jobs. Here’s a coupon link for 5% off your first job 🙂 (applied while checking out). May I remove the autoexport csv and use only order export after create new order? I have been searching for something like this. I am selling fruit and veg boxes and ordering opens for 24 hours once a week. Once all orders are placed I want a report that has the customer names across the top and the products down the left side so then I can add up how much of a particular item has been ordered by everyone. Can this be done and what would the report be called? Hey Lucy, afraid this isn’t possible with our plugin in the way you’ve described. You could do a default – one row per item export, then sort it by the item_name column, which would let you see how many rows there are for that product (thus how many times it was ordered). Customer names will always be within one column though rather than across the top. Is it possible to output the shipping costs as a single row in the “Legacy – One Row per Item” template? I use your CSV export to import orders into my accounting software (Twinfield), which needs to import every amount as a single line. The same goes for the bundled products, which are exported under Fees? My only solution till so far has been to export in the default format and then use Excel to stack each order line into multiple lines. I first merge the line_items with the shipping_items and fee_items into a single cell with a specific separator and then split each item up in a single row (maintaining the same order number, date, etc) defined by the separator to get the same result as the Legacy template. This method is very cumbersome however, since it relies on the export file with the exact same defined number of columns, which changes with updates. Any suggestions would be greatly appreciated. I wouldn’t be surprised if more people run into this problem as well. Hey Ardjan, sure there’s no reason you couldn’t add a row that totals the shipping costs in its own row. However, customizing the export format as heavily as you’ve outlined would require some custom code — we typically recommend Codeable for this, as they’ve customized the plugin in the past. Hey Stuart, you’re correct that it can only currently do minutes, but if it needs to be automated each month you do so via custom code instead. Is this a common issue? How can I change order and name of column of exported csv file?